Pokhara International Airport project has achieved physical progress of 8 percent in the last six months. 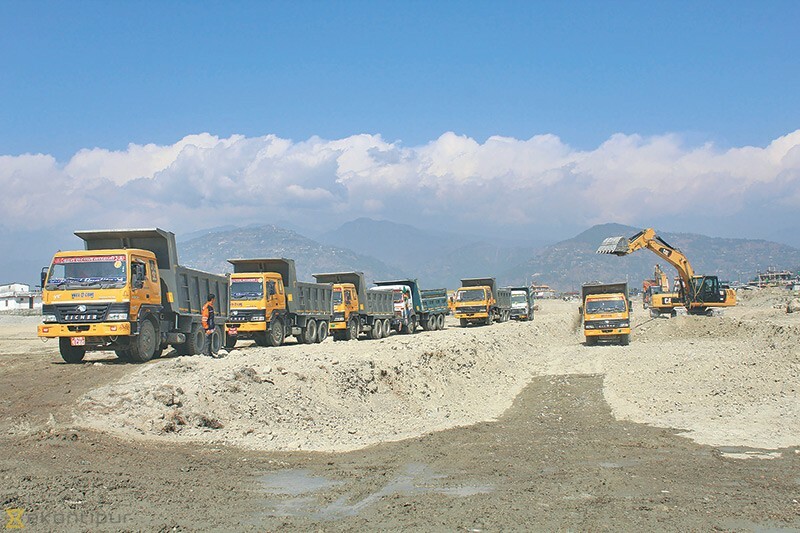 The construction of the project in Chinnedanda — 3km east of the existing Pokhara airport — started in August last year. The project contractor, China CAMC Engineering Co, has been levelling the ground in the initial phase of construction. Sanjiv Khadka, chief of the project, said that constructing buildings and other infrastructure works will be expedited after May. “The current physical progress is satisfactory so far,” he said. According to him, 80 percent of soil related works will be completed by May. Krishna Chapagain, an information officer of China CAMC Engineering, said that during the monsoon, they will begin works on runway, terminal building, hanger, aircraft parking bay and other infrastructure. “We have been proceeding on track to complete the project on its scheduled completion deadline,” he said. The project is expected to be completed by July 10, 2021. The government had signed a $215.96 million soft loan agreement with China EXIM Bank in March 2016 for the construction of a new airport in Pokhara, a national pride project. Then Prime Minister KP Sharma Oli had laid the foundation stone for the airport on April 13, 2016. Currently, there are 100 Nepalis and 40 Chinese workers working at the project site. According to project officials, in order to complete works in the stipulated timeframe, the Chinese workers will not be given time off to celebrate the upcoming Chinese New Year. February 14 marks the Chinese New Year. According to Chapagain, they have completed the design of runway and terminal building and have dispatched the report to the Civil Aviation Authority of Nepal (Caan). “Immediately, after the soil works are completed, it needs Caan’s approval to go ahead for other infrastructure. Nearly 45 heavy equipments have been mobilised at the project site. Meanwhile, the project has brought lab testing and other instrument to test the quality of soil at the project site on Thursday. “The instrument will be used to test the quality of soil and rocks including other construction materials,” said Chapagain. The soft loan pact for the airport was signed during the then prime minister Oli’s visit to Beijing in March last year. As per the agreement, the government will receive the loan from China EXIM Bank, 25 percent of which will be interest-free. The interest on the rest of the loan has been fixed at 2 percent per annum. The loan repayment period has been fixed at 20 years, including a grace period of seven years when no interest will be charged. The government will bear the foreign exchange risk, a potential risk that may arise from fluctuations in foreign exchange rates. China CAMC Engineering won the construction contract in May 2014. As per the feasibility report, the airport’s runway will be 2,500 metres long and 45 metres wide. It will accommodate medium category jets like the Boeing 757 and the Airbus 320. The airport will be built under the engineering procurement and construction (EPC) model. Under the EPC contract, a single contractor takes responsibility for all components like design, engineering, construction and procurement. The contract binds the contractor to deliver the project at the stipulated time and at the predetermined price regardless of any possible cost overruns.